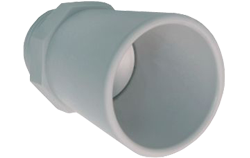 Long Range Sensing | MaxBotix Inc.
MaxSonar® sensors are used in a variety of applications. Many customers have successfully used our sensors at ranges up to 10 meters. 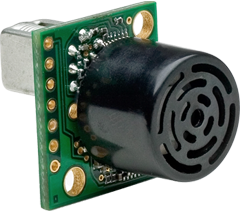 While not every sensor we produce will range out to 10 meters, many of our product lines do contain long range sensors with 10 meter ranging capabilities. 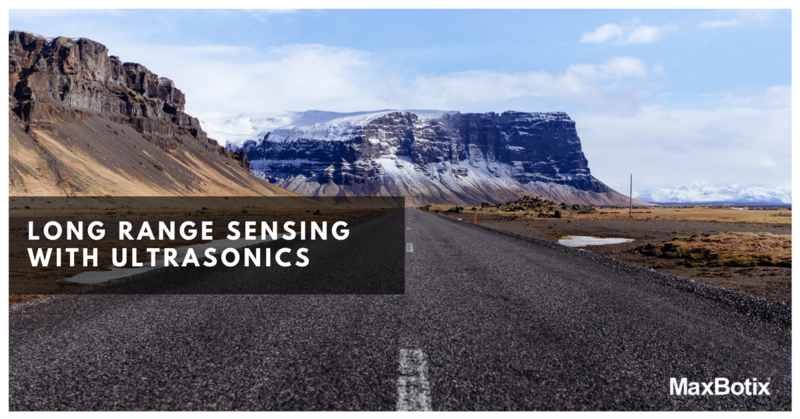 Even though a sensor provides 10 meter ranging, there are some limitations that will disqualify our long range sensors for use in some applications. MaxSonar® sensors utilize ultrasonic sound waves to create the sound burst. The sound waves dissipate as they flow through the air. If they do not return to the sensor, then the sensor is unable to calculate the distance to the target. Target detection beyond 10 meters requires that the sound waves return with enough amplitude for the sensor to correctly process the sound data. Typically, only large flat targets that are perfectly aligned to the sensor can produce such a reflection. This is possible in a lab environment; however, this is not practical outside of a controlled setup. Additionally, the angle of incidence or the angle at which the sound waves hit the target will also affect long range detection. If the target object is not completely perpendicular to the sensor, the sound waves can miss the sensor on the bounce back from the target. The further back the sensor is placed from the target, the more precisely perpendicular the sensor must be to the target. Because long range sensing requires such a high degree of precision in the mounting of the sensor, we have capped our long range sensors at 10 meters. One common request is for long range people detection. We recommend two main sensors for this task: the MB7363 HRXL‑MaxSonar®‑WRLS and MB1260 XL‑MaxSonar®‑EZL0. 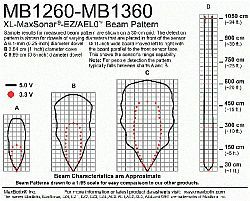 When reviewing the MB7363 beam pattern a person falls between graphs A and B which offers approximately 5.4 meters (18 feet) to reliably detect a person inside of the beam pattern. For greater detection, our MB7974 Snap-On Horn amplifies the detection abilities of the MB7363 for slightly greater sensitivity which helps to slightly extend the range of people detection. The MB1260 shows a wide beam pattern with a detection range of approximately 4.8 meters (16 feet). 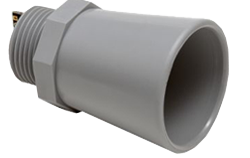 MaxBotix® Inc., continues to press the limits of our sensor technology by continually pursuing technological advances to provide reliable long range sensing beyond 10 meters. We welcome customer feedback and questions on our long range sensors. If you have any questions or need any help with sensor selection, please email our support team at [email protected]. We are happy to help! Long range sensing with ultrasonics is certainly achievable, and many of our sensors can accurately rage up to 10 meters. Because long range sensing requires such a high degree of precision in the mounting of the sensor, we have capped our long range sensors at 10 meters.